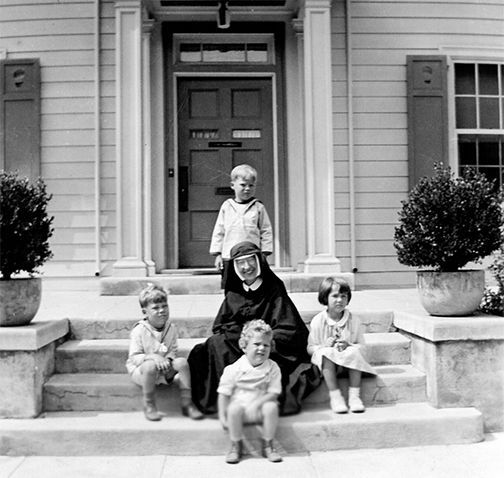 In the month of January Holy Child Schools celebrate the life of Cornelia Connelly, founder of the Society of the Holy Child Jesus. Cornelia may have never walked the hallways and courtyards of our Mayfield campus yet her spirit and deep commitment to the possibilities within education have been lovingly sustained and passed on by the Sisters of the Holy Child Jesus who opened our school in 1931, the lay educators who so identify with her beliefs and all Holy Child students and alumni around the world who carry a small piece of Cornelia’s legacy with them always. The following story written by Elizabeth Strub, SHCJ, was originally published in 2009 for Cornelia’s 200th birthday celebration. On this 200th anniversary of Cornelia Connelly’s birth, I’d like to go back only 72 years to my first grade at Mayfield. I think it sums up everything Cornelia believed in about education. You may remember the book “Everything I Need to Know I Learned in Kindergarten.” I can say the same for my first grade experience at Mayfield. When I tell you why, you will have a thumbnail sketch of Cornelia’s educational system. First, the setting: Mayfield was a very small, struggling-to-survive convent school on Euclid Avenue. It had been founded only two or three years earlier advertising itself as K through 12, but some classes had no more than three pupils. There were no lay teachers; the nuns did everything, from fund-raising to teaching to cooking our hot lunch. It was a happy, tight little world embraced by the Holy Child community of Sisters. Mayfield was sunny and outdoorsy, but on rainy days, a dangerous river gushed down Euclid Avenue from the mountains. And the rain made a deafening din on the corrugated roof of the lunchroom. 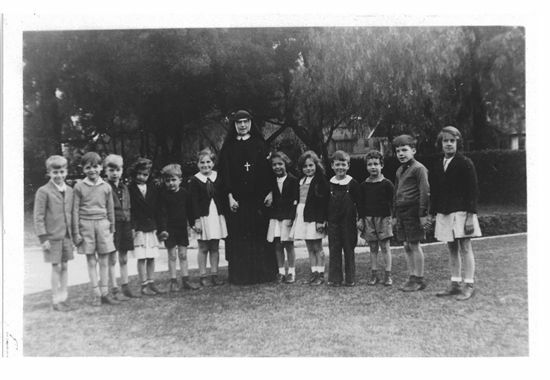 The first grade classroom was a kingdom apart presided over by Mother Mary Bede, aka Mummy Bede. If you said Mother Mary fast, it became “Mummy”. She was young but we thought she was old. She had just come from a course in Montessori education, so we were amazingly well equipped with all the tools and toys of Maria Montessori’s treasure chest: frames with flaps to button up, hook up, tie up, boxes of sticks to represent ones, tens and hundreds, little chairs and tables - pink for girls, blue for boys – cots to sleep on after lunch, rugs to sit on at story time. It was learning by doing. Montessori fit hand in glove with the Holy Child ethos. We learned how to handle things carefully and to treat each other affectionately. At recreation we were let loose to run pell mell in games of tag and scream our heads off. If one of us was absent with a cold, he or she got a batch of letters with drawings from everyone in the class, including Mummy Bede, hand delivered by the driver of the school bus. I can still name and clearly remember almost all of my classmates. We were very unique little persons with sharply defined personalities, each welcomed because different. Religion was not something rare and strange; the holy was in our midst and it was warm and loving. We made our first communion that year, and it may surprise you that we prepared for it with a silent retreat preached by a Jesuit. I’m talking about six-year-olds. It was a solemn event in our lives without being at all stiff or regimented. Often I had a long wait after school before being picked up. Occasionally, I’d be the only one left. Sister Sebastian would see me and bring out a glass of the most delicious iced tea. (All my life, I’ve tried to equal it.) If it became even later, I’d watch the nuns bring out their sewing, put their chairs in a circle on the lawn and have public reading from a spiritual book. Many times they would draw me into the circle until the horn honked on Bellevue Avenue. Indeed, Mayfield became for me a magic circle of affectionate inclusion. Without consciously adverting to it, I’ve carried my first grade with Mummy Bede and the writers of all those get-well notes with me for 72 years. That single year sent me through life with Cornelia’s little cross on my forehead and the mark of her spirit inside. 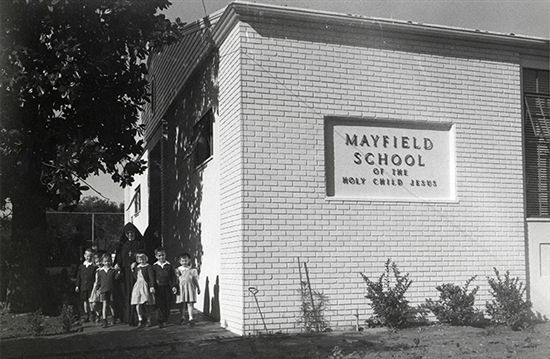 Located in Pasadena, California, Mayfield Junior School of the Holy Child Jesus is a K-8 Catholic coeducational private school. Our kindergarten, elementary school, and middle school experience best prepares students for high school education and beyond.